Each year I write a series of posts concerning air quality in Missouri. This post begins a series to update the information with data from 2014. Since then, many steps have been taken to reduce air pollution, and air quality has improved dramatically. However, 2012 saw a decrease in good air quality days across the state, and an increase in unhealthy air quality days. Was that just a one time event, or has the trend continued? Since the 1980s the EPA has gathered air quality data from cities and counties in Missouri and maintained it in a national database. The following posts look at data from 2003-2014. In addition, to give a longer term perspective, they include data for 1983 and 1993. 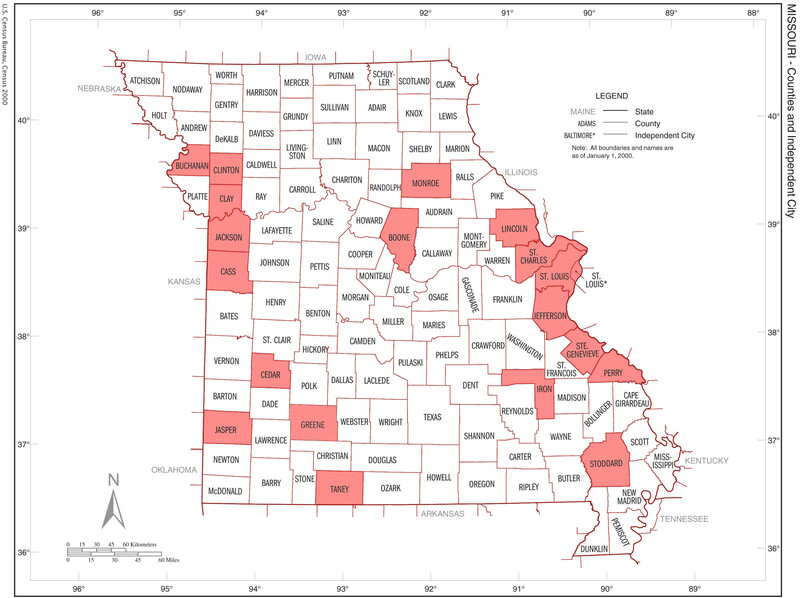 Counties in Missouri for which air quality data is collected. Source: My modification of a map published by the U.S. Census Bureau. This year I look at 20 counties in Missouri, the same ones as last year. Though the EPA data includes 2 more counties, measuring began in them only recently, thus, meaningful trends over time cannot be inferred. A map showing the locations of the 20 counties is at right. They can be gathered into three groups: a group along the Mississippi River, a group in the Kansas City-St. Joseph Area, and a widely dispersed group that does not fall into either of the other two groups. The EPA constructs an air quality index based on measurements of 6 criterion pollutants: particulates smaller than 2.5 micrometers particulates between 2.5 and 10 micrometers, ozone, carbon monoxide, nitrous oxide, and sulphur dioxide. Particulates are tiny particles of matter that float around in the atmosphere. When we breathe, we inhale them, and if there are too many of them, they cause lung damage. There are 2 sizes: inhalable coarse particles have diameters between 2.5 and 10.0 micrometers, while fine particles have diameters less than 2.5 micrometers. 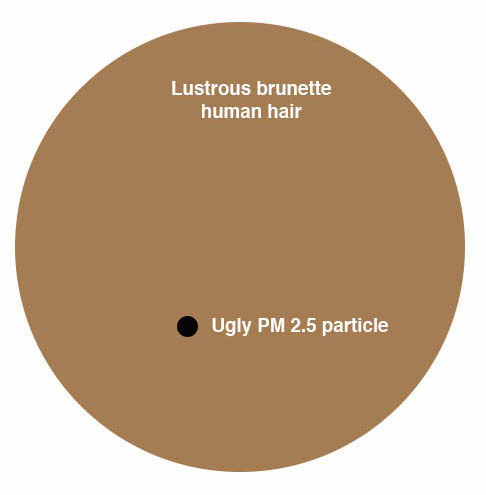 Illustration: a PM2.5 particle is about 1/30 the diameter of a human hair. Ozone is a highly corrosive form of oxygen. High in the atmosphere, we need ozone in order to absorb ultra-violet radiation. But at ground levels, it is corrosive to plants and animals, and too much of it can cause lung damage. Sulphur dioxide smells like rotten eggs. Too much of it causes lung damage, and it also reacts with water vapor in the atmosphere to form sulphuric acid, one of the main ingredients of acid rain. A series of posts I wrote on background air pollution shows that background levels of sulphur dioxide have decreased over the last 30 years. However, concentrations of it can still build up and affect public health near emission sources. Nitrous oxide is corrosive and reacts with ozone and sunlight to form smog. It is also one of the main causes of acid rain. Background levels in the atmosphere have decreased, but it, too, can build up locally near emission sources. The biggest sources of air pollution are power plants, industrial facilities, and cars. These tend to concentrate in urban areas, but air quality can be a concern anywhere; some of Missouri’s air quality monitoring stations are located near rural lead smelters, for instance. In addition, weather plays an important role in air quality. On some days, weather patterns allow pollution to disperse, but on others they trap it, causing air quality to worsen. Hot, sunny summer days are of particular concern, although unhealthy air quality can happen any time. Black Tuesday was in November, after all. The EPA has established maximum levels of each pollutant, and reports the number of days on which there are violations. The EPA also combines the pollutants into an overall Air Quality Index, or AQI, in order to represent the overall healthfulness of the air. The AQI is a number, but it does not have an obvious meaning. Suppose the median AQI is 75 – what does that mean? So the EPA has created six broad AQI ranges: Good, Moderate, Unhealthy for Sensitive Individuals, Unhealthy, Very Unhealthy, and Hazardous. EPA reports a yearly AQI number and the number of days in which the AQI falls in each range. In the following posts, I will update Missouri’s AQI, then the specific pollutants that seem to cause repeated problems. Environmental Protection Agency. 2015. Particulate Matter: Basic Information. Web page last updated 9/10/15. Viewed 11/6/15 at http://www3.epa.gov/airquality/particlepollution/basic.html. Wikipedia. 1939 St. Louis Smog. Web page last modified 9/25/15. Viewed 11/6/15 at https://en.wikipedia.org/wiki/1939_St._Louis_smog. By mogreenstats in Air on 2015/11/06 .